When it launched in the middle of 2017, Honor Band 3 offered a fresh new design, heart-rate monitoring, and sleep tracking at an affordable price. While that seemed good on paper, it did have a few kinks which we discovered in our review. Honor went back to the drawing board and has now come up with a successor, the Honor Band 4. Priced at Rs. 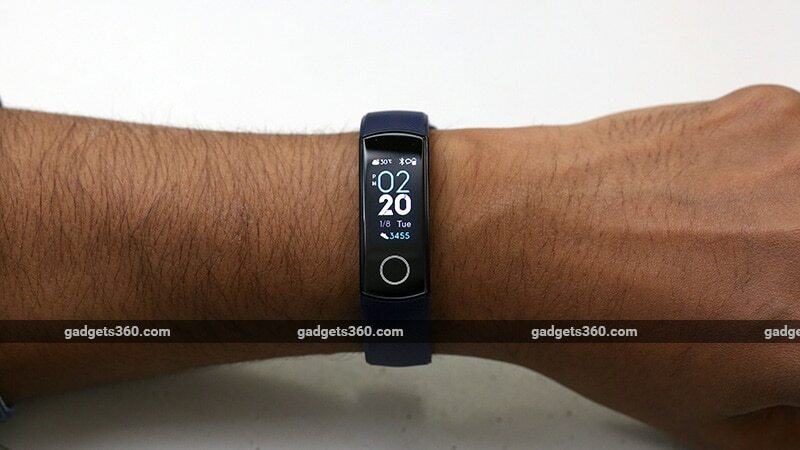 2,599, is this the fitness band for you, or should you pick up the Xiaomi Mi Band 3 instead? Read our review to find out. The Honor Band 4 at first glance looks similar to the device it replaces. It is sleek and light, so it won't feel awkward if you wear it all the time. 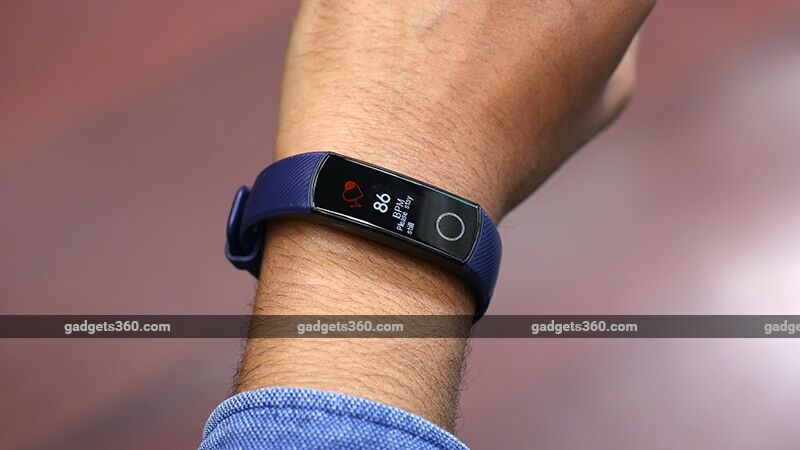 Unlike the Xiaomi Mi Band 3 which has a removable core (capsule) and a band, the Honor Band 4 is one piece. The capsule does not separate from the band, and as a result, you don't have the freedom to use different bands here. Our review unit had a blue band, but you can choose to buy this device in pink or black. That said, the band you get on the Honor Band 4 is of very good quality and did not show any sign of wear during our review period. We didn't like the clasp design of the Honor Band 3 as it dug into our forearms leaving small marks. Honor has changed this with the new model, and you get a watch style clasp. This opens and closes easily, and has a lower chance of coming off compared to the earlier model. The core of the Honor Band 4 has a 0.95-inch AMOLED touchscreen with a resolution of 240x120 pixels. It also has a capacitive back button. Honor has gone with a colour display which stands out, considering that most other bands at this price point offer black-and-white screens. One other strong point of this display is its sunlight legibility. It is bright enough to be seen outdoors, and users can choose between three levels of brightness right from the band. Honor is among a few manufacturers to offer a touchscreen at this price point. The screen is responsive and we were able to swipe through the options easily. The capacitive button acts as a back button when scrolling through the UI. Flip the band over and you will see the heart rate sensor and two pogo pins for charging at the bottom. The heart rate sensor is slightly raised compared to the rest of the body, and will leave a mark on your hand if you put the band on tightly. Just like the Honor Band 3, this new model also uses a proprietary clip-on charger. It is quite tiny, with pogo pin connectors for charging the band and a Micro-USB port for input. The charger is easy to lose, but you may be able to find a replacement charger online. The Honor Band 4 works with both Android phones as well as the iPhone via Huawei's Health app. The process of pairing the band to your phone is easy, and the app is well designed. 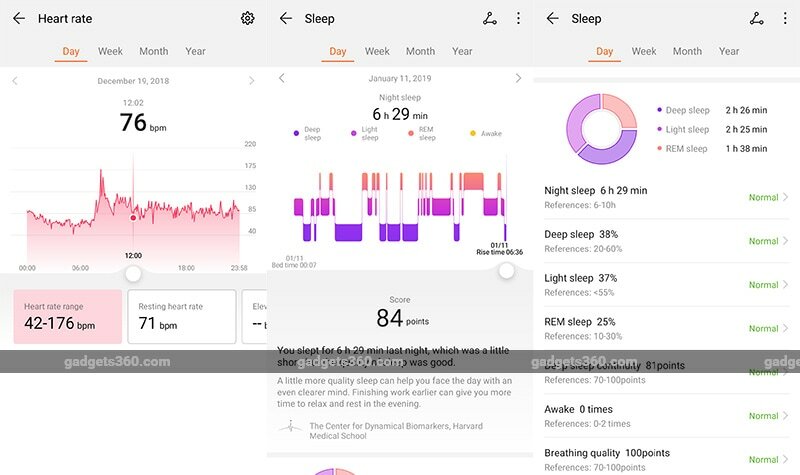 At one glance, the app give you information about the number of steps taken, your last recorded heart rate, and how well you slept the previous night. We found that when paired with an Android phone, the Huawei Health app keeps a persistent notification around — just like many other companion apps — so that it isn't killed in the background. This ensures that the band is constantly connected to the phone to sync its data. Theoretically this will have an impact on the battery life of the connected smartphone, but it wasn't significant enough for us to notice. In the app you will find a record of the number of steps you have taken. This can be sorted day-by-day or month-by-month to give you an idea of your progress. The app can also be used to customise what functions are available on the band and the order in which they appear. Also, the app allows you to share data with Google Fit, MyFitnessPal, and UP by Jawbone. Step tracking was slightly inaccurate on the Honor Band 4 in our tests. We counted 1,000 steps manually while walking around, and the band recorded 985 steps. If you are planning on using a fitness band primary for tracking steps, then this isn't as accurate as the Xiaomi Mi Band 3. The Health smartphone app also has an independent step counter that keeps ticking in your phone's notification panel and is measured using the accelerometer on the phone. We found this to be inaccurate as well. The step count kept increasing while we were driving around. Heart rate tracking was more accurate, and gave us similar results as a Mi Band 3 when we compared the two simultaneously. Continuous heart rate tracking is available on the Honor Band 4, and it can log your heart rate throughout the day at two-minute intervals. Once synced with your phone, you can see your heart rate range and resting heart rate. It also has an elevated heart rate alert which will warn you if your resting heart rate exceeds the set limit for more than 10 minutes at a stretch. The Honor Band 4 lets you track outdoor and indoor runs, outdoor walks, indoor cycling, pool swims, and free training. We used the outdoor walk tracking mode and walked a distance we knew was exactly 1km. The band measured the distance as 0.96km which is an acceptable deviation. The Honor Band 4 does not have a dedicated GPS chip and relies on the connected smartphone to determine its location. We also used the free training mode for a gym workout session. It kept heart rate tracking on constantly but could not get a proper reading most of the time. When it did manage to get a reading, it wasn't accurate. Sleep tracking is accurate, and the band could detect the time we fell asleep and the minute we woke up. It could break our sleep down into Deep sleep, Light sleep, REM sleep, and waking periods using Huawei's Trusleep sleep tracking algorithms. It also analysed our sleep quality and gave us suggestions and tips on how to improve sleep quality. You can set an alarm on the Honor Band 4, and it is capable of vibrating and waking you up at the set time. We had to use the smartphone app to set an alarm, which should have been possible on the band itself. Honor claims that the battery on the Band 4 will last for six days with continuous heart rate tracking on, and 17 days under normal use, on a single charge. In our usage, which included alerts for incoming calls and notifications, continuous heart rate tracking, and Huawei's Trusleep sleep tracking, the band lasted for only three and a half days. With the continuous heart rate option switched off, the band only consumed 40 percent of the battery in six days. The band charges quickly and we were able to get it to 70 percent in an hour by connecting it to a USB charger. The Honor Band 4 also has NFC support and we found support for Alipay in the band's UI, but that's of no use here in India. NFC isn't used for anything else. The Honor Band 4 improves on its predecessor with a better display, improved heart rate and sleep tracking, and better distance accuracy. However, all this comes at the cost of lower battery life. Its closest competitor, the Xiaomi Mi Band 3, offers accurate step tracking and is priced slightly lower. The Mi Band 3 is versatile and accurate, and you could save a little money without losing much functionality. However, if you want a better display and sleep tracking is a priority, the Honor Band 4 should be the one for you. product Honor Band 4 is an improvement on the Honor Band 3 but is it better than the Xiaomi Mi Band 3? Read our review to find out.